This geomagnetic data comes from the NOAA Space Weather Prediction Center. 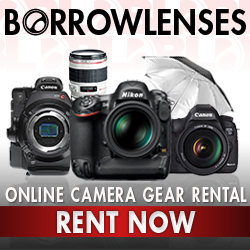 Click the ??? tab next to each section to learn what it represents. The time shown on each graphic is always in UTC time (also known as GMT), and must be converted to your local time zone. The sunlit side of Earth is indicated by the lighter blue of the ocean and the lighter color of the continents. The day-night line, or terminator, is shown as a region that goes from light to dark. The lighter edge is where the sun is just at the horizon. The darker edge is where the sun is 12 degrees below the horizon. 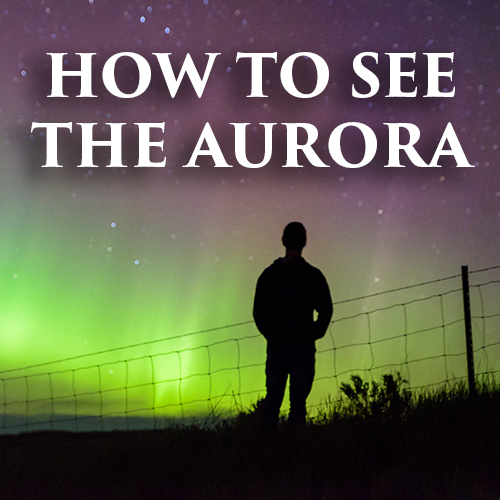 Note that the aurora will not be visible during daylight hours; however, the aurora can often be observed within an hour before sunrise or after sunset. Data updates every 5 minutes. The data on this graph comes from NASA's Advanced Composition Explorer (ACE) Satellite. ACE is positioned at the L1 Lagrange Point about 1.5 million km from Earth in the direction of the sun. The satellite samples and measures the solar wind up to 1 hour before it reaches Earth. Note: Since July of 2016 ACE is no longer the primary source for solar wind data. The new satellite DSCOVR (data shown below) is generally more reliable. The data from ACE frequently blacks out for a number of hours. Bt/Bz (white/red lines) - Bt indicates the total strength of the Interplanetary Magnetic Field (IMF) carried by the solar wind. A higher number indicates a stronger impact to earth's magnetic field. Bz indicates the orientation of the IMF. If the Bz is positive (northward), then the earth's magnetic field will block most of the solar wind, and geomagnetic storming is unlikely. But if Bz is negative (southward), then the sun and the earth's magnetic field will link up, which allows the solar wind to pour into the earth's atmosphere, causing the aurora. The further southward the Bz points and the longer the duration, the higher the chance is of a geomagnetic storm occurring. Phi (blue line) - Phi is the angle of the IMF measured in the GSM (geocentric solar magnetospheric) coordinate system. Sudden and rapid changes in the Phi angle in conjunction with increased solar wind speeds and Bz fluctuations is common during a CME impact. Density (orange line) - The solar wind carries with it plasma (electrons and protons). This is measured in atoms per cubic centimeter. 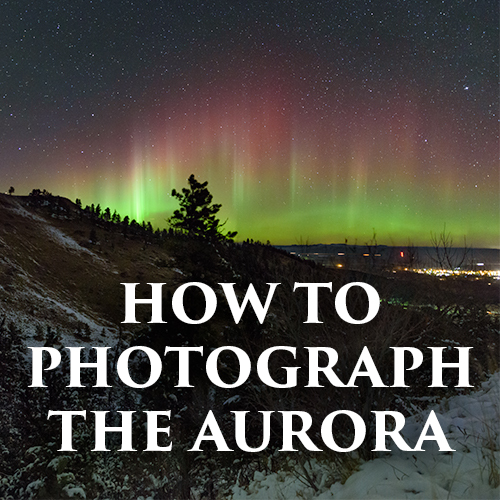 A high and fluctuating plasma density is usually better at stirring up the aurora. Speed (yellow line) - Measured in kilometers per second, the speed of the solar wind can vary from 250 - 800+ km/s. A faster solar wind is usually associated with elevated geomagnetic activity. Temp (green line) - The temperature of the solar wind is measured in Kelvin units. A rise in temperature is likely during an impact to earth's magnetic field. The real time solar wind data on this graph comes from NASA's Deep Space Climate Observatory (DSCOVR) Satellite. DSCOVR is positioned at the L1 Lagrange Point about 1.5 million km from Earth in the direction of the sun. The satellite samples and measures the solar wind 15 to 60 minutes before it reaches Earth, and the SWPC uses this data to issue warnings. Note: Since July of 2016, DSCOVR is the primary source of solar wind data. The data is generally more reliable than that from the ACE satellite, which is now used as a backup. The bottom half of the graph shows a short-term KP value prediction as well as the DST value. DST (Disturbance Storm Time index) is a measure in nanoTeslas of the ring current around earth and the strength of the magnetic field. 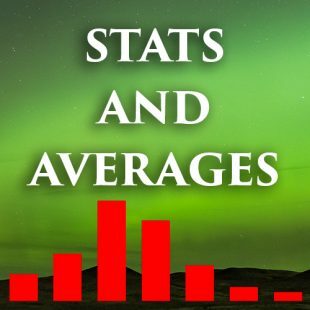 Sharply negative values are associated with geomagnetic storms. The "Estimated KP - 3 HR" chart is of limited use because it only updates every 3 hours. 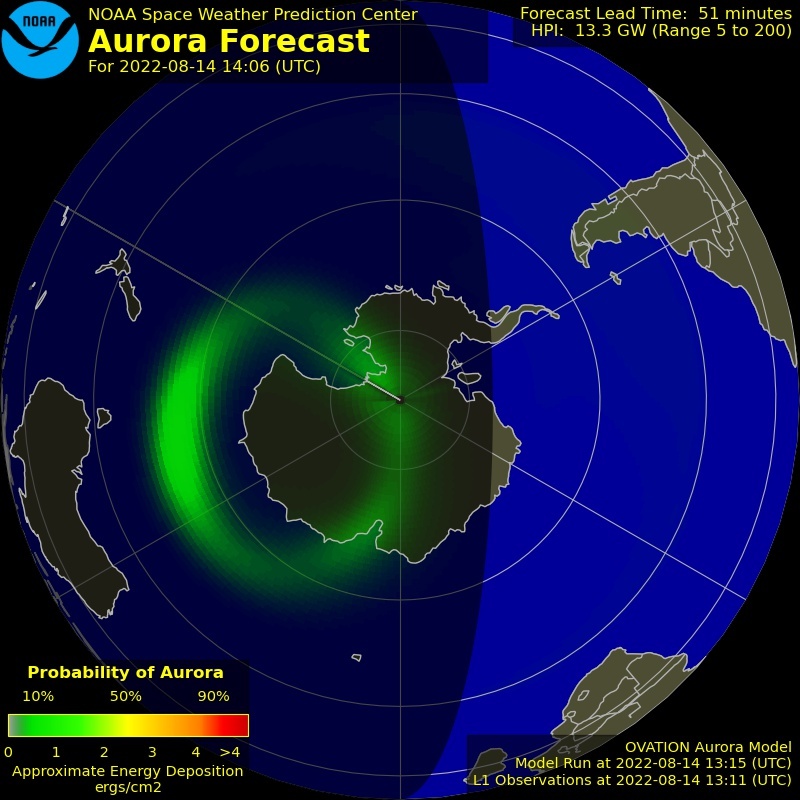 Activity may vary during those 3 hours and a geomagnetic storm may be completely over by the time it refreshes. The KP index is shown over a 3-day period. 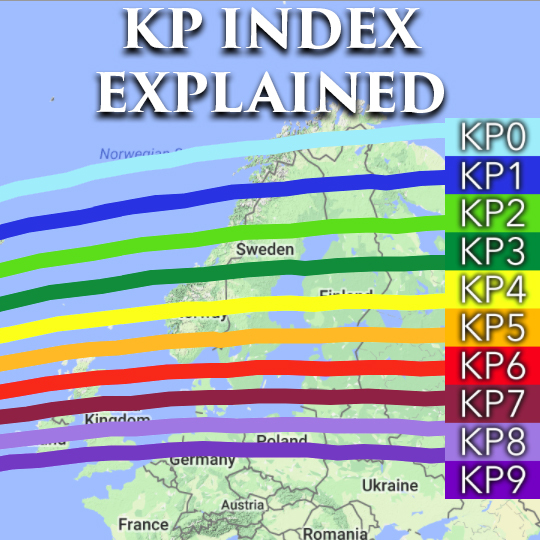 These plots show the latest predicted Kp index from the U. S. Air Force Weather Agency Wing Kp model. The plots are of 1-hour and 4-hour Kp predictions, along with the observed Estimated Kp. The dashed white line represents the current time. 1-hour predictions are plotted with green filled-in circles, 4-hour predictions are plotted in green plus (+) symbols, and the solid blue line is the observed Estimated Kp index. The solid horizontal green bars show the 3-hour interval over which the latest predictions are valid. Vertical error bars are plotted in green to show the 50% confidence interval. Prediction points are plotted at the model valid time (run time + propagation time), which is usually 60 minutes into the future for the 1-hour prediction and 240 minutes into the future for the 4-hour prediction. 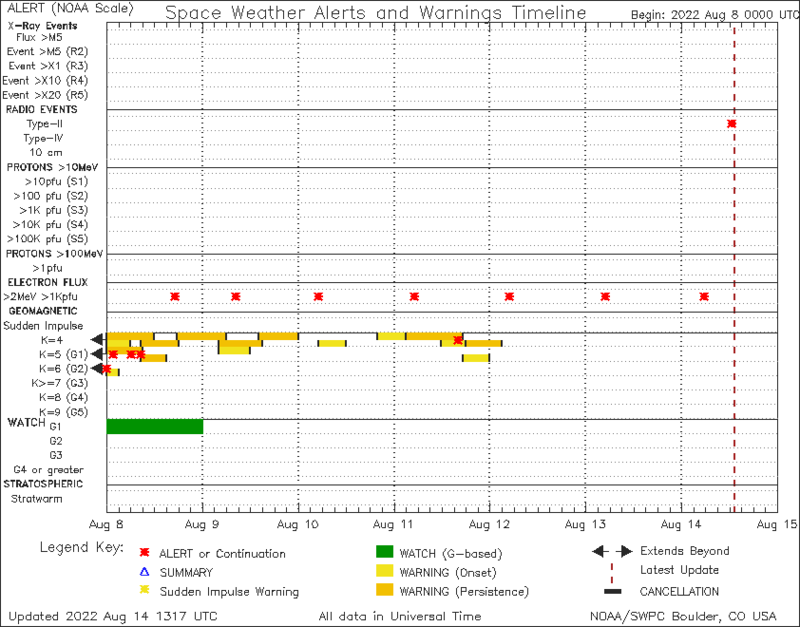 The dashed red line indicates the lowest alert level, G1 (minor), on the NOAA Space Weather Scale for Geomagnetic Storms. The timeline provides a quick look at the alerts, watches, and warnings that are currently in effect from NOAA. 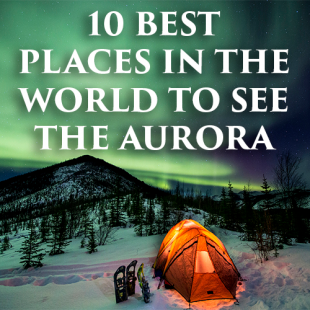 Only the bottom half of the chart is important when it comes to seeing the aurora. The dashed red vertical line represents the current time. 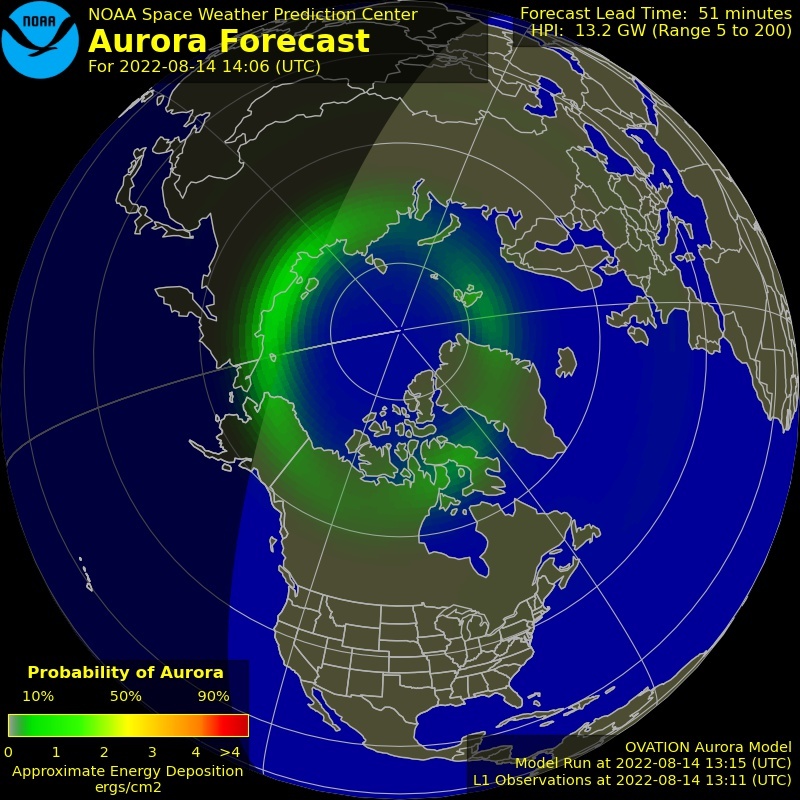 A solid green bar represents a watch, when NOAA is predicting a geomagnetic storm to occur. A watch is issued for 24 hours at a time, because the exact timing can be very uncertain. Watches don't always verify, but they can still provide a heads up. 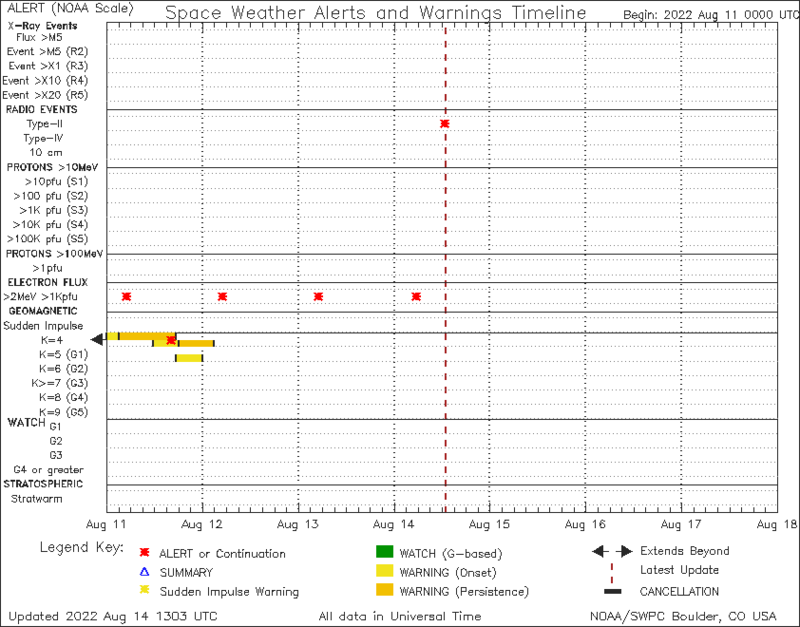 A solid yellow or orange bar represents a warning, after a threshold of Kp4 or above has been reached. A warning will be issued for several hours at a time, but the geomagnetic storm may not last for the entire duration.